Choosing the most appropriate oral anticoagulant has become a challenging decision in the management of patients with atrial fibrillation and one that often generates significant discussion on rounds. Unfortunately, no trial has compared all of the available options head-to-head, so data must be extrapolated from several sources, all while attempting to incorporate patient-specific characteristics that might make one strategy better than another. Because the topic comes up so frequently, I developed the following algorithm to help guide my recommendations and thought I would share. Each point below corresponds to a section of the algorithm shown above. For patients with a known history of atrial fibrillation (AF), decisions regarding oral anticoagulation should consider previous management strategies, including relative degree of success. Evidence indicates that patients who are successfully anticoagulated with warfarin may continue to do well with warfarin compared to those who are newly initiated on therapy or transitioned to other agents [1,2]. Notably, this trend has not been observed in patients transitioned from warfarin to the higher dose (150 mg) of dabigatran . In the landmark trials comparing the new oral anticoagulants (OACs) rivaroxaban or dabigatran to warfarin, the mean INR time in therapeutic range (TTR) for patients randomized to warfarin ranged from 55% to 64% [2,3]. A mean TTR in the mid-60% range is generally considered the gold standard when comparing an agent to warfarin, which explains why the low TTR observed in ROCKET-AF was such a major criticism of the trial. While a mean TTR in the mid-60% range represents the global management of patients on warfarin therapy, some centers are able to achieve much higher mean TTR values. How successfully a patient has been (or could be) managed on warfarin therapy should be factored into management decisions, as none of the new OACs have been compared to warfarin in patients with higher TTR ranges. Patients who have been successfully managed on warfarin therapy should still be presented with the option of transitioning to a new OAC if they find the monitoring and lifestyle restrictions (e.g., diet) associated with warfarin therapy to be inconvenient. Most guideline authorities recognize the importance of including patients in this management decision. However, the limitations of these new agents (many of which are included in this document) should be fully disclosed to patients prior to making a decision about anticoagulation therapy. The following is a list of several important limitations with the new OACs. Valvular heart disease. Patients with valvular heart disease were specifically excluded in the major trials comparing the new OACs with warfarin. Because these patients are generally at higher thromboembolic risk (especially those with certain types of prosthetic valves), it is unknown whether the new OACs provide a degree of anticoagulation comparable to warfarin in these settings. Extreme body weights (< 60 kg or > 120 kg). The mean body weight of patients in the trial comparing dabigatran to warfarin was 82.5±19.4 kg and the mean BMI of patients in the trial comparing rivaroxaban to warfarin was 28 ± 3 kg/m2; patients at the very extremes of these body weight ranges have not been well-studied [2,3]. Doses of other anticoagulants (e.g., enoxaparin) are adjusted by weight, so it is unknown whether the new OACs provide a comparable degree of anticoagulation in patients with extremely low or high body weights at the fixed doses studied in randomized trials. History of significant gastrointestinal hemorrhage. In the trials comparing rivaroxaban or dabigatran to warfarin, both agents were associated with significantly increased rates of gastrointestinal hemorrhage. While this fact is a well-known adverse effect of dabigatran, some clinicians may be unaware that similar risks were observed with rivaroxaban. Active or advanced liver disease. Patients with active or advanced liver disease, including those with evidence of coagulopathy (e.g., elevated INR at baseline), were excluded from major trials comparing the new OACs to warfarin. Furthermore, rivaroxaban undergoes significant hepatic metabolism and is known to accumulate in patients with significant hepatic impairment . Dual antiplatelet therapy for coronary artery disease required. Few patients on dual antiplatelet therapy (i.e., aspirin plus a P2Y12 receptor inhibitor) were included in the major trials comparing the new OACs to warfarin [2,3]. Of those that were, few if any were on the combination of aspirin and prasugrel (a combination associated with a higher risk of major and fatal bleeding at baseline) and none were on ticagrelor. Therefore, for patients at a lower risk of stroke and in whom the risk of bleeding associated with the addition of warfarin is thought to outweigh the potential benefit, it may be reasonable to use only dual antiplatelet therapy for the critical period after the index event (including whether a coronary stent was placed) and then transition to warfarin after that time. While the combination of aspirin and clopidogrel is inferior to warfarin for stroke prevention in the setting of atrial fibrillation, it does provide some degree of protection while these patients are recovering from an acute event [1,5]. For patients with a higher risk of stroke due to atrial fibrillation, it may be reasonable to use the combination of aspirin, a P2Y12 inhibitor, and warfarin targeted to a less aggressive INR goal (i.e., 2 – 2.5), a recommendation recently incorporated into management guidelines for non-ST segment elevation myocardial infarction . Emerging data indicates that these patients may also be safely managed with a P2Y12 inhibitor and warfarin alone, although these results have not been fully published nor included in clinical practice guidelines. Other conditions. Patients with other conditions that may influence drug metabolism (e.g., advanced heart failure), where monitoring of anticoagulation status may be necessary to ensure ongoing safety, should still be considered for warfarin therapy. Use of currently available measurements of anticoagulation status (e.g., prothrombin time, ecarin clotting time, activated partial thromboplastin time, etc.) to guide therapy with the new OACs has not yet been well-validated. Cost is an important consideration when initiating therapy with a new OAC, as issues related to access and ability to pay are some of the most significant contributors to patient non-adherence. The new OACs are generally more expensive than warfarin, even for patients with health insurance and prescription drug coverage, including (in most cases) when the expenses associated with warfarin monitoring and follow-up are also considered. The manufacturers of the new OACs have some financial assistance programs available, and these should be considered for those patients who are unlikely to do well with warfarin but who are also unable to afford a new OAC. Renal impairment may be the most important limitation with the use of the new OACs. End-stage renal disease. Both dabigatran and rivaroxaban should be avoided in patients with severe renal impairment (creatinine clearance [CrCl] < 15 mL/min) due to the risk of drug accumulation. Severe impairment. Patients with moderate renal impairment (CrCl 15-60 mL/min) may be considered for therapy with a new OAC. While an adjusted dose of dabigatran is available in those patients with some degree of renal impairment (CrCl 15-30 mL/min), data to support its use is derived from pre-clinical trials and pharmacokinetics rather than prospective evidence. Therefore, this guideline recommends rivaroxaban in those patients, as the dose adjusted for renal impairment (15 mg daily, for CrCl 15-50 mL/min) was included in the large trial comparing it to warfarin . Moderate impairment. For patients with moderate renal impairment, age should become an additional consideration regarding which new OAC to choose, as equations commonly used to predict renal function are far less accurate in older patients, especially those with low body weight (i.e., muscle mass). The inaccuracy of these equations may help explain why increased rates of hemorrhage have been observed with dabigatran in older patients (see additional explanation in Part G below). Mild impairment or normal. For patients with normal renal function or only mild renal impairment, dabigatran should be used preferentially over rivaroxaban, as it showed clinical superiority to warfarin in the large randomized control trial comparing the two agents. At a dose of 150 mg twice daily, dabigatran demonstrated improvements in the composite endpoint of stroke and systemic embolism (as well as several secondary endpoints) with a comparable degree of overall bleeding and less bleeding in several key subgroups (including intracranial hemorrhage). On the other hand, rivaroxaban was shown as only being non-inferior to warfarin in the primary analysis of its comparison trial with a lower incidence of overall bleeding. Therefore, this guideline gives preference to dabigatran, except in cases where its advantages over warfarin are less likely (e.g., renal impairment, older age), making rivaroxaban a more ideal choice. As mentioned above, estimates of renal function are less predictable as patients age. As a result, older patients with adequate renal function (as predicted by the Cockcroft-Gault or other equations) may actually have a significant degree of renal impairment. In these patients, the risk of accumulation with dabigatran may outweigh its potential benefits, making rivaroxaban a more ideal choice. Additionally, a post hoc analysis of the RE-LY trial as well as pooled data from adverse event reports indicates that the risk of major bleeding associated with dabigatran increases significantly in older patients.7 Although various age thresholds for avoiding dabigatran have been proposed (e.g., > 75 years, > 85 years), the median age of patients experiencing adverse events with dabigatran is around 80 years, so this threshold was chosen for this tool. Even if patients have normal renal function or mild impairment, caution should still be exerted when initiating dabigatran in patients over the age of 80 years given the limited ability to estimate renal function in this patient population. Note: Some contend that the once daily dosing of rivaroxaban provides it with a significant clinical advantage to dabigatran, especially in patients with poor medication adherence. However, this is not yet supported by the literature and may be a risky proposition given the increased rates of thromboembolic events observed in patients transitioning from rivaroxaban to warfarin following the conclusion of ROCKET-AF . Additionally, it is generally thought that medication adherence is not significantly impacted until patients are required to take medications three times a day and many patients with atrial fibrillation are already taking other medications twice daily (e.g., certain beta blockers, antiarrhythmics, antihypertensives, etc.). Finally, based on pharmacokinetic comparisons between dabigatran and rivaroxaban (e.g., duration of action, termination half-life), dabigatran may provide a similar degree of thromboembolic protection compared to once daily rivaroxaban even if doses are missed (although this is not yet based on evidence from the literature). As always, comments and suggestions (and disagreements, of course!) welcomed. Connolly S, Pogue J, Yusuf S, et al; for the ACTIVE Investigators. Clopidogrel plus aspirin versus oral anticoagulation for atrial fibrillation in the Atrial fibrillation Clopidogrel Trial with Irbesartan for prevention of Vascular Events (ACTIVE W): a randomised controlled trial. Lancet. 2006 Jun 10;367(9526):1903-12. Patel MR, Mahaffey KW, Califf RM, et al; for the ROCKET AF Investigators. Rivaroxaban versus warfarin in nonvalvular atrial fibrillation. N Engl J Med. 2011 Sep 8;365(10):883-91. Connolly SJ, Ezekowitz MD, Wallentin L, et al; RE-LY Steering Committee and Investigators. Dabigatran versus warfarin in patients with atrial fibrillation. N Engl J Med. 2009 Sep 17;361(12):1139-51. Kreutz R. Pharmacodynamic and pharmacokinetic basics of rivaroxaban. Fundam Clin Pharmacol. 2012 Feb;26(1):27-32. Wann LS, Curtis AB, Yancy CW; et al. 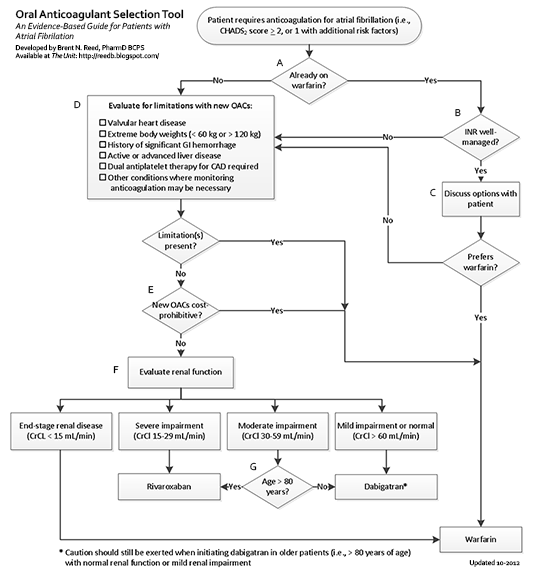 2011 ACCF/AHA/HRS focused update on the management of patients with atrial fibrillation (Updating the 2006 Guideline): a report of the American College of Cardiology Foundation/American Heart Association Task Force on Practice Guidelines. J Am Coll Cardiol. 2011 Jan 11;57(2):223-42. Jneid H, Anderson JL, Zidar JP, et al. 2012 ACCF/AHA Focused Update of the Guideline for the Management of Patients With Unstable Angina/Non-ST-Elevation Myocardial Infarction (Updating the 2007 Guideline and Replacing the 2011 Focused Update): A Report of the American College of Cardiology Foundation/American Heart Association Task Force on Practice Guidelines. J Am Coll Cardiol. 2012 Aug 14;60(7):645-81. Eikelboom JW, Wallentin L, Yusuf S, et al. Risk of bleeding with 2 doses of dabigatran compared with warfarin in older and younger patients with atrial fibrillation: an analysis of the randomized evaluation of long-term anticoagulant therapy (RE-LY) trial. Circulation. 2011 May 31;123(21):2363-72. Very nicely done! Does a great job of streamlining the thought process that often takes place when selecting an appropriate oral anticoagulant for a patient with atrial fibrillation. One point to consider is that ROCKET AF studied the reduced dose of rivaroxaban (15 mg) only in patients with CrCl 30-49 mL/min, but to the best of my knowledge it was not studied in patients with a CrCl < 30 mL/min in that trial. Impressive work, as always! You're exactly right -- patients in ROCKET-AF were required to have a creatinine clearance (CrCl) of at least 30 mL/min and those with CrCl 30-49 mL/min were assigned to receive the renally-adjusted rivaroxaban dose (15 mg daily). While I was originally torn by the idea of recommending rivaroxaban for patients with CrCl of 15-30 mL/min, my reasons for eventually including it were twofold. First, patients with renal impairment who received the lower dose of rivaroxaban did not experience a decrease in efficacy when compared to warfarin, which is data we currently do not have to support the renally-adjusted dose of dabigatran (75 mg twice daily). I would not anticipate any further reductions in efficacy with rivaroxaban at even lower clearance thresholds. The question that remains, however, is whether it continues to be safe at a CrCl of 15-30 mL/min, which is a more challenging question but one I eventually felt comfortable with given the drug's pharmacokinetics. With a half-life of 5-9 hours in normal patients and a duration of anti-Xa action that is minimally different at a CrCl of 15-30 mL/min when compared to higher CrCl thresholds (Figure 4 from Reference 4 illustrates this relationship well), I would not anticipate excessive bleeding (at least not any more so than warfarin) at these lower renal function thresholds. Some might even argue that it may be more effective at these lower CrCl ranges since the drug's anti-thrombotic effects might actually last for a significant portion of the day! But again, as you point out (and I agree), it is important to recognize that these interpretations are based on the pharmacokinetics of the drug rather than comparisons from clinical trials. The Unit has moved to its own domain! Please update your bookmarks to http://www.reedrx.com/unit. A cardiology clinical pharmacist and faculty member practicing at an American academic medical center.